Has The Climate Bill Been Delayed? Not Really. 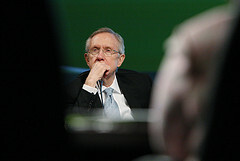 The Wall Street Journal blared the news today that the Senate won't vote on a climate bill until "some time in the spring," according to Majority Leader Harry Reid. Is that a shock? A new setback? Not that I can tell. The reporter, Ian Talley, insists that Reid's words reflect a "weakening political will to tackle a long-term environmental issue," but I don't really see much weakening here. What's happening is that the health care debate is still gurgling along, so of course everything else is getting nudged back. But the key senators all seem to be proceeding more or less apace on a climate bill. The "tripartisan" talks between John Kerry, Lindsey Graham, and Joe Lieberman are still ongoing, and Kerry has promised to release an outline of the deal before the Copenhagen summit in December. Meanwhile, the Finance Committee, which is mired in health-reform land, is still planning to mark up the climate legislation around January. And then some of the other committees—like Agriculture and Commerce—will toss in their own two cents. All that translates into a floor debate… sometime in the spring. It's a sluggish process, sure. Lots of senators are still nervous about pushing ahead. But not a whole lot has changed, as best I can tell.